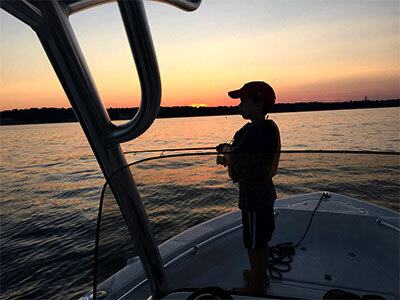 The tidal Potomac River offers some of the finest fishing, crabbing and shellfishing on the Atlantic coast. The estuary runs from the tidal fresh waters of Washington, DC to the mid-range salinities of the Chesapeake Bay at Point Lookout, Maryland and Smith Point, Virginia. The Potomac not only serves as a very fine "fishing hole", it also serves as the state boundary line between Maryland and Virginia, and is the home of two other political jurisdictions, the District of Columbia and the Potomac River Fisheries Commission. The Potomac River Fisheries Commission is a Maryland and Virginia bi-state Commission, which regulates all fishing on the tidal mainstem of the Potomac between Washington, DC and the Chesapeake Bay, exclusive of the tributaries on either side of the river. Each of these four jurisdictions has the authority to, and does, publish and enforce rules, regulations and laws dealing with such fishing matters as seasons, size limits, creel limits and licensing requirements. Knowing where you are fishing is important because licensing requirements, season and limits can be, and sometimes are, quite different. It is your responsibility to know what the laws are where you are fishing, crabbing or oystering. 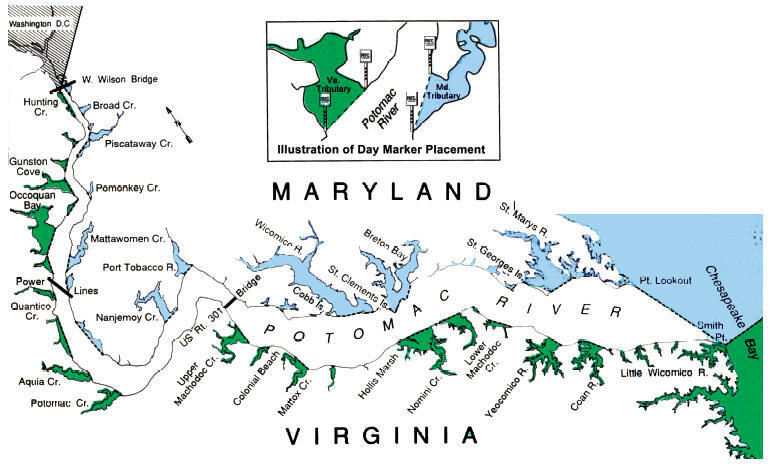 The Potomac River Fisheries Commission, in cooperation with the State of Maryland, Commonwealth of Virginia and the District of Columbia, maintains a system of day markers at the mouths of the various creeks, bays and inlets, which are tributary to the Potomac. On several of the larger tributaries, intermediate spar or can buoys are maintained. The day markers consist of a 4-foot by 4-foot sign mounted on a steel piling. They are white with an orange border and black lettering. They are individually numbered and lettered and are generally located in shoal water near the headlands of the tributaries. This drawing may be useful in helping you decide where you are fishing! IF YOU HAVE ANY QUESTIONS PERTAINING TO LICENSE REQUIREMENTS OR REGULATIONS IN THE DIFFERENT JURISDICTIONS, PLEASE CONTACT THE APPROPRIATE AGENCY.